If you only want to view the MPEG livestream file (.ts) then use VLC player, which is the best player around. But if you want to convert the .ts file to eg. 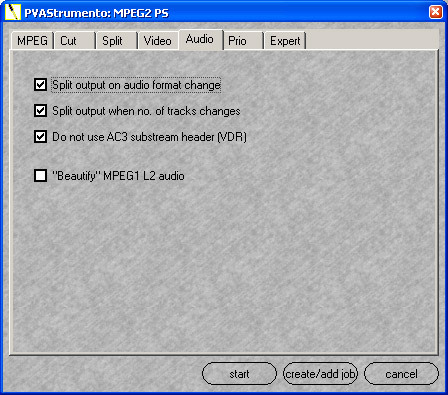 Mpeg 2, or MPA/MPV format for later creation of DVD discs, read the following guides. First you the download PVAStrumento at http://www.offeryn.de. This guide uses version 2.1.0.14.
you will get alot of info about the file in the right text box. 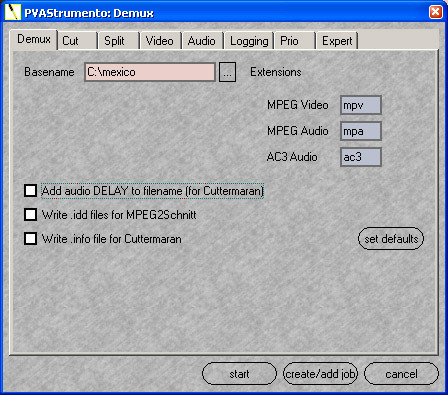 First choose the location and filename of the Mpeg 2 file you want to create. Be sure to click on 2048 Bytes, to make a PC (and DVD) playable mpeg-file. Press on the “Split” tab. This parts is quite optional. If the target system is a Windows XP/2000 system, then choose “Do not split”. If you want to playback the file on a Linux system, choose 2 GB. Next press on the “Video” tab. Next press on the “Audio” tab. Next press on the “Prio” tab. Next press on the “Expert” tab. Again just use the default setting. Next press on the “start” tab. 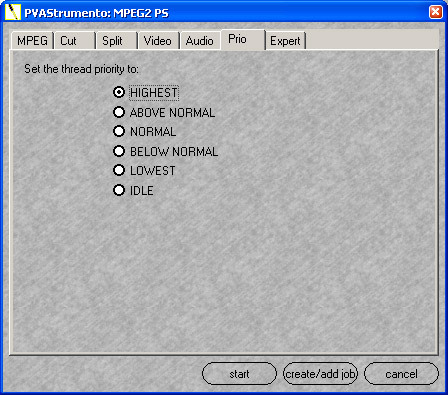 And the Mpeg 2 file is created! 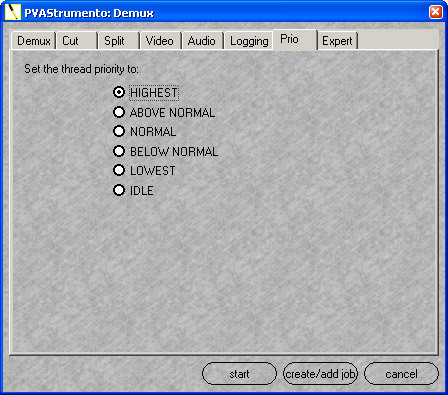 Start PVAStrumento’s GUI version and chooce your .ts file. First choose the location and filename of the mpv/mpa file you want to create. You want to create DVD’s with appr. 4 Gb each, so write 4000 mb in the “user defined” field. Click “Split (almost) evenly”. Press on the “Video” tab. Press on the “Audio” tab. Press on the “Prio” tab. Press on the “start” tab. And the files are generated on the choosen location. I have a Hitech XPS DVB PVR receiver and I have been so busy in the last week trying to figure out how to convert my .ts recordings to DVD discs. Thank you very much! I hope this works. Awsome! I must have tried at least 10 different converters to get ts-files from my Hauppauge TV-card into mpg-files that my Video-editing software can handle. None even came close to the quality PVAStrument did. Not to mention how fast and easy it was. Could never have done it without your easy to follow manual. Thanks! Thanks, this .ts file has been crashing VLC and your article helped point the way to a solution. how long is this supposed to take? i see no progress bar and it just stands still with no change, except for the working indication thingy…..it does not seem fast or easy…..
Hm, its seems to me that maybe your installation and/or your files is broken. Are you trying to build a DVD mpeg? Try to screen record a video of want you do, upload it to youtube and send me the link, then i’ll try to see what is wrong. I suspect the .ts file i somewhat broken, and VLC just “ignores” the errors. thanks but i have a question when i convert the .ts files it makes a echo on the music???? Is it a HD .ts file? I am using the Humax Foxsat HDR and am able to get the .ts file off onto my USB stick, then using the above procedure convert to mpg2 or dvd. I would also like to do the reverse, ie convert an mpg2 or other video format to the correct .ts format, transfer it via usb to the Foxsat’s HD, then play it and watch on my large screen TV. Is there anyway to achieve this reverse process? I am guessing that I would need all three files in the reverse process? Hi. I’m trying to convert .ts files transferred from my Humax DuoVisio. Used Gui version which seemed to install OK. Pressed “start” and it very quickly made a conversion but only of the first 30 secs or so and there was no audio. What am I doing wrong? Now, open an old dos cmd window (start>run>cmd) then cd to directory where your files are. now, use “rename 123.ts.001 123.ts” hopefully you’ll get the same results I did which worked. My guess is that once the 1024 Mb file limit is reached the next file is spanned, hence the .001 extension. good luck. I really miss the punch card days. Rock: No, sorry. None that i am aware of. But surely there is tools out there that can help. If you want – i can make a guide for that? Sdsalt: No, its for windows only. But google about ffmpeg/mplayer on Linux. Its possible to merge two .ts files, but make sure that your OS supports >2GB files. The conversion process fails and generates the following log. Do you know what is the problem? ALERT> No sequence header found for info. ** that all content are really available! .. keeping track of audio offset accumulation. .. strict checking of audio framing. .. splitting on change of video format. .. splitting on change of audio format. .. splitting on number of audio tracks. .. creating new GOP timecodes. ALERT> Cannot sync. Not enough data. What is the best way to use this software to make dvds from HD .ts files, which are generally much bigger in size than the capacity of a dvd. 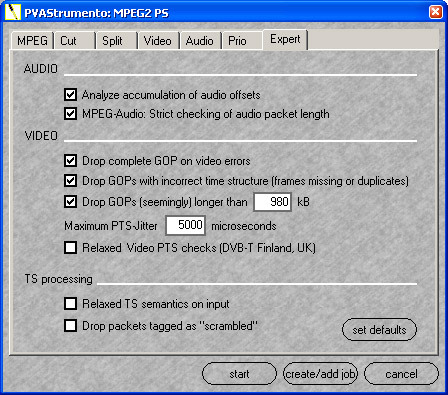 In particular, should the files be split maintaining a high bitrate or is there a way of reducing the bit rate to fit the the entire file to a dvd. 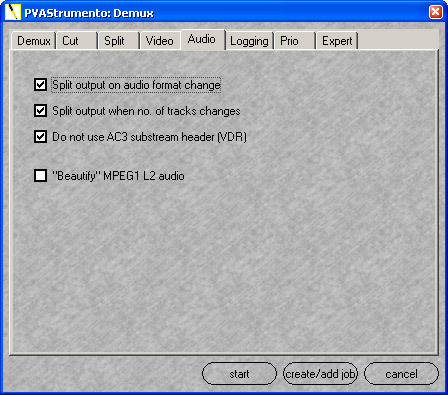 Great tip but I’m sorry to say I get no audio playback my version of PVAStrumento is 2.1.0.22 could you please help? Thank you for your wonderfull tutorial. Please, I need more information about how to cut and edit the video with this software. mepg tex was found why?